Turns out it’s a while, if you’re me, and you have a baby, and you take a trip to a city that experiences a cataclysmic flood while you’re there (because that puts a damper on the knitting, in every sense of the word “damper”), and your husband leaves town for a week on business. 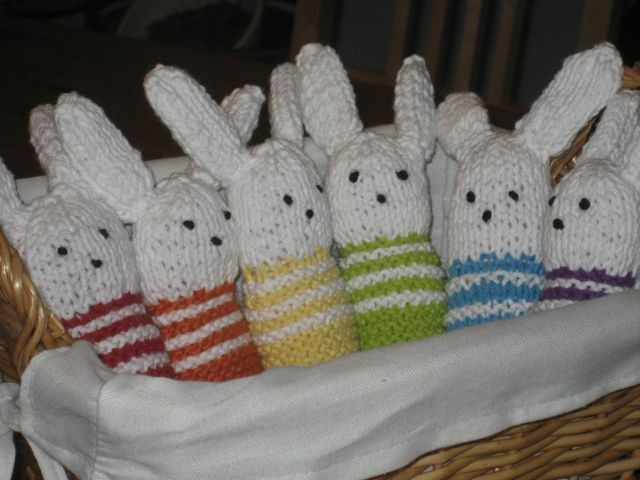 Last week all I did was take care of the baby and knit bunnies and drive my big kids to school & back. But on Thursday, finally, I finished. I took on this project because I didn’t want to spend $45 on a mobile at a big-box baby store. Granted, this one doesn’t spin or sing, but Juliana doesn’t seem to care. 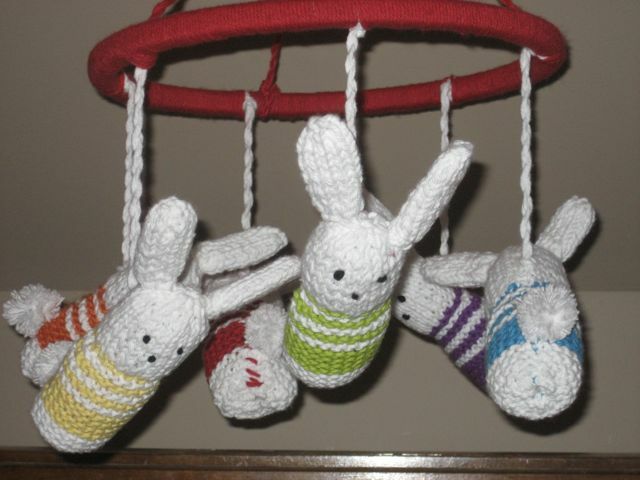 This mobile is constructed in such a way that when we don’t need a mobile anymore, we can choose to take it apart and remove the hanging strings so that the bunnies can just be soft toys. Even better, it was made entirely from stash except for the embroidery hoop - so the total cost at the moment of the project was $2. Project: Bunny Mobile, based on Nana’s Bunnies, both from Vintage Knits for Modern Babies (Ten Speed Press, 2009).Yarn: Sugar ‘n’ Cream dishcloth cotton, with the exception of the orange stripes. Since I couldn’t find a ball of orange cotton in my stash, I used Brown Sheep Lamb’s Pride Worsted wool in Orange You Glad. Needles: Size 4 bamboo straights. Mods: After the first bunny, I sewed the ears on before sewing the body seam. I didn’t stuff the ears at all; I thought the seam stitches on the inside made them puffy enough. And a couple of bunnies have some mistakes that I chose to leave there - just stockinette stripes rather than garter stitch. Also, the pattern calls for a knitted rickrack to cover the embroidery hoop; I wrapped the entire hoop with yarn instead, because a) I didn’t want to bother with gauge, b) I used a larger-than-recommended hoop to accommodate six bunnies rather than four, c) I was not at all confident that 171 stitches would fit on my needles, and d) I was kinda tired of knitting. I really like this book. As I said once before, it doesn’t have schematic drawings, and that’s potentially hazardous. While this super-fun project was simple and straightforward, I do think the book as a whole is for an advanced beginner or an intermediate knitter due to the lack of schematics and the omission of some construction details (like “use mattress stitch for seams”). More to come later in the week… stay tuned. Gotta go feed the baby again. And again. And again. Did I mention she’s growing? They are sweet but I’m not sure that I’d want to fiddle with more than one. There again, maybe I would if it was for my bundle of joy.